This is a call open to all faculty and research staff at SERC Universities for research proposals. 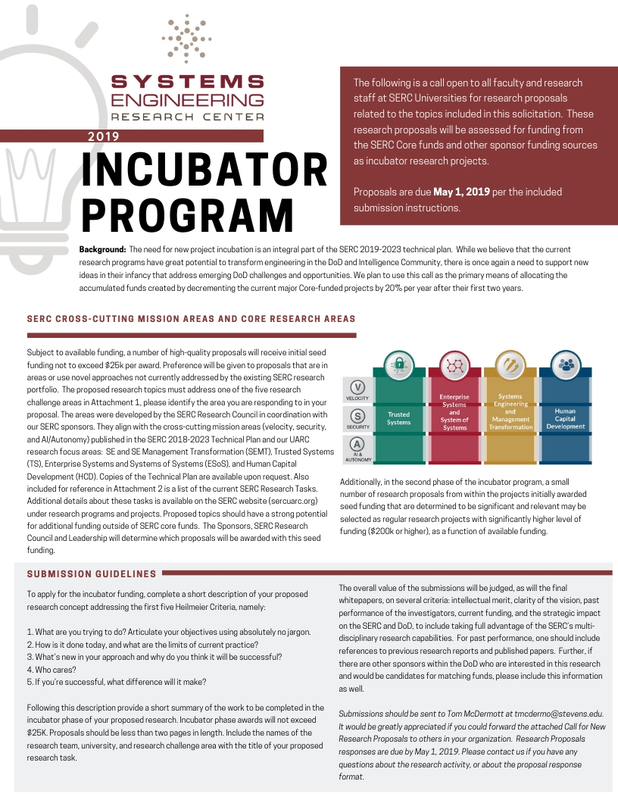 These research proposals will be assessed for funding from the SERC Core funds and other sponsor funding sources as incubator research projects. The need for new project incubation is an integral part of the SERC 2019-2023 Technical Plan. While we believe that the current research programs have great potential to transform engineering in the DoD and Intelligence Community, there is once again a need to support new ideas in their infancy that address emerging DoD challenges and opportunities. We plan to use this call as the primary means of allocating the accumulated funds created by decrementing the current major Core-funded projects by 20% per year after their first two years. Subject to available funding, a number of high-quality proposals will receive initial seed funding not to exceed $25k per award. Preference will be given to proposals that are in areas or use novel approaches not currently addressed by the existing SERC research portfolio. Additionally, in the second phase of the incubator program, a small number of research proposals from within the projects initially awarded seed funding that are determined to be significant and relevant may be selected as regular research projects with a significantly higher level of funding ($200k or higher). The deadline for the submission of papers is May 1, 2019. Submissions should be sent to Tom McDermott, Deputy Director, SERC.